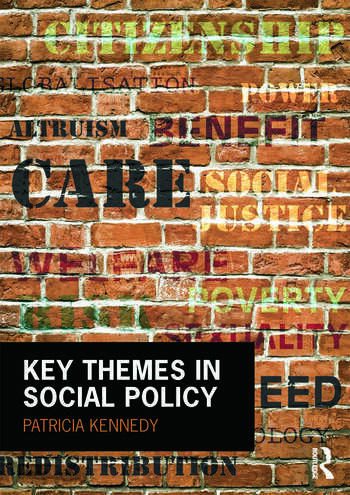 Key Themes in Social Policy provides an accessible and authoritative introduction to the key concepts used in social policy, from autonomy to wellbeing. outlines some of the key thinkers and research on the topic and gives suggestions for further reading. Making it easy to understand and use the most important ideas in the area, this is an essential companion for all students taking social policy courses. Patricia Kennedy is a Senior Lecturer in Social Policy in the School of Applied Social Science at University College Dublin, Ireland. She has taught social policy since 1993 and co-founded the Irish Social Policy Association in 1997.